Carl is engaged in a project, which combines contemporary concepts of sculpture with references to ancient discoveries of human culture, iron smelting and navigation. 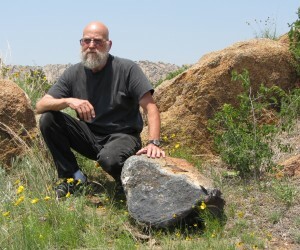 Utilizing his 30 years of Iron Casting experience, Carl casts iron ‘stones’, which are then placed either as sculptures in a public park or sculpture exhibit or are left as anonymous markers at remote but significant locations around the world. Sculpture is at the core of the Lodestone project. The concept of an enduring object, crafted by man, replicating a natural form and imbued with historical meaning has always been a locus around which sculptors have worked. 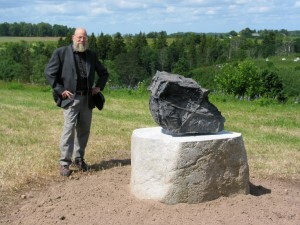 Ojars Feldbergs, Latvian sculptor and director of Pedvale Sculpture Park invited Billingsley to cast and site a Lodestone at Pedvale during the Midsummer celebration in 2009. In Latvia the summer equinox is a very special holiday, which is celebrated with fire and nightlong revelry. The history of this celebration dates to pre-Christian time and many northern countries share the tradition. The enduring mysteries of fire and transformation are additional aspects of the “performance” of casting the Lodestones, which the public finds fascinating. Ancient metal smiths were considered to have special powers and secret knowledge. They were both respected and feared and the objects that they created were also considered to have a spirit. Perhaps these ideas still resonate when people witness sculpture being born in the fire of the furnace. At this writing, Lodestones have been cast and placed at Pedvale Outdoor Museum & Sculpture Park in Latvia, The Wichita Mountains of Oklahoma, Josephine Sculpture Park in Kentucky and in a National Park in Costa Rica. 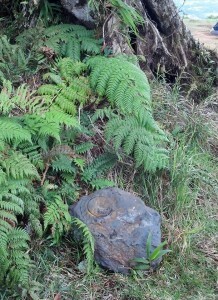 Another Lodestone has been cast in Wales and is awaiting placement somewhere in the UK. 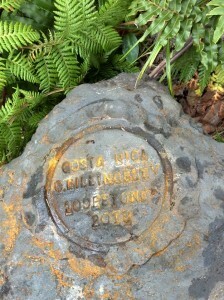 As Lodestones are cast and placed they are documented, GPS marked, and added to the website. Using local stones, Billingsley makes molds and then casts exact replicas of the stones in iron. 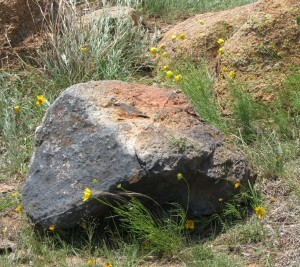 With approximately three times the density of granite, the Lodestones are extremely heavy and difficult to move about but except for color, in outward appearance, they look exactly like the rocks in the area. In time, they will change from the dark grey color that they exhibit when first removed from the mold and develop the dark red rust color that iron develops through oxidation. Unless discovered and re-melted by future generations, the Lodestones should last an extremely long time. The longest lasting elements on Earth are stone and ceramic but massive pieces of iron will oxidize very slowly and not at all if located where there is little or no free oxygen. 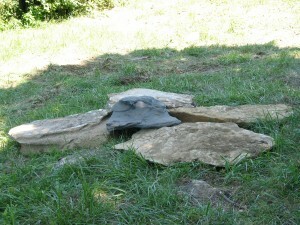 Although many Lodestones are installed in Sculpture Parks or elsewhere as sculptures, Carl expands on the concept of sculpture by placing Lodestones as anonymous objects in the environment. Lodestone thus becomes a worldwide sculpture installation that lives in the future as various Lodestones await discovery. Billingsley plans to “place” Lodestones in the Atlantic and Pacific oceans, preferably in deep trenches, by burying them at sea. These Lodestones will probably never be seen again, but their locations will be plotted by GPS. Carl finds no inconsistency in treating the Lodestones as both sculptures and as anonymous objects in the landscape or “lost” at sea. In both cases the iron Lodestones are markers, both metaphors and real objects, markers of time and timeless forms of nature.